The announcement that Frederick J. Ryan, Jr., former Assistant to President Ronald Reagan and Reagan’s post-White House Chief of Staff is to become the Publisher of The Washington Post brought forth a minor Twitter-storm of speculation among Republicans that Ryan’s appointment would move the Nation’s struggling newspaper of record to the political Right. But Ryan’s appointment brought forth no such speculation from the remaining longtime Reaganites who remember Fred Ryan, not as President Reagan’s Director of Presidential Appointments and Scheduling, but as the person who helped oust the President’s longest-serving and most loyal supporters from the Board of the Reagan Presidential Library and threw a wall around the former President during his retirement years, isolating him from his oldest friends and supporters. Nofziger began his piece thusly: "Ronald Reagan, you have broken my heart. Finally.. . . You have let Nancy and the rich and beautiful people with whom she has surrounded herself and you force off the board . . . three of the most dedicated and selfless Reaganites there are." In criticizing the decision to remove Judge Clark, Ed Meese and Marty Anderson Mr. Nofziger wrote, "Yes, I know you were a long way from being a perfect president… I thought that sometimes you listened to and took bad advice. I thought that toward the end you were paying too much attention to what history might think of you — a mistake most presidents make." Nofziger later doubled down on his criticism of the move by observing that the three were dumped "because they're old Reagan people and don't fit in with that new crowd, who come around to butter him up and try to take advantage of what he was." Nofziger, one of Reagan's original political advisers, lamented to The Los Angeles Times at the time Clark, Meese and Anderson were dumped that his former colleagues "brought the history of the Reagan movement to the library. They brought a point of view and the experience needed to make it function properly." And Nofziger's concern about what the Reagan Presidential Library would become under the new regime, soon to be headed by Fred Ryan, turned out to be prescient. Far from becoming a leading conservative think tank and the institution that would keep the flame of Reaganism alive, the Reagan Presidential Library has become just another presidential library. Hosting events and exhibitions on baseball and race cars and giving awards to and providing a speaking venue for such un-Reagan-like figures as liberal Republicans General Colin Powell*, former Massachusetts Governor Mitt Romney and New Jersey’s Governor Chris Christie. While Nofziger, who passed away in 2006, is no longer available to confirm or take issue with the identification of Fred Ryan as the architect of the ouster of Meese, Clark and Anderson, others who go back to Reagan’s California days confirm that Ryan, as Reagan’s Chief of Staff and a member of the Presidential Library Board, was one of Nancy Reagan’s “pretty boys” and fit Nofziger’s characterization of the “beautiful people” Nancy Reagan preferred to surround herself with to a tee. Those Republicans who are looking for a shift to the Right at the new Jeff Bezos-owned Washington Post might be well advised to recall that after the purge of Meese, Clark and Anderson from the Presidential Library Board, Fred Ryan remained the only former Reagan White House staff member on the Board. 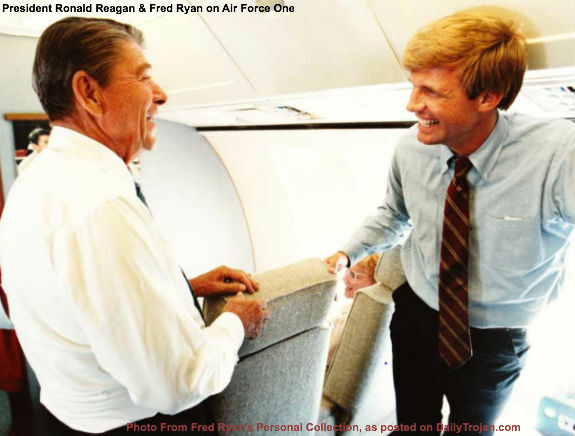 Eventually, he became Chairman of the Board and found employment with one of the family enterprises of another Reagan Library Board member, Joe L. Allbritton. Far from being a “keeper of the flame” of Reaganism, like Meese, Clark and Anderson, Fred Ryan became a businessman and is now comfortably ensconced as a member of Washington’s inside elite. And money, as they say, has no politics. As vice-chairman of the television, cable, and internet company Allbritton Communications, in 2007 he helped the company establish POLITICO, the favored online outlet of the Capitol Hill elite and the harsh and persistent critic of the Tea Party movement and its Reagan-inspired limited government constitutional conservative agenda. *Yes, we know Powell served as Ronald Reagan's National Security Advisor at the end of his second term, but he has had none of the fire for continuing Reagan's policies that Richard Allen and the other members of the early Reagan national security team exhibited after leaving the White House and the Pentagon.